Home Government News South China Sea Hague court to hear China Sea dispute. Hague court to hear China Sea dispute. October 30, 2015. The Philippine News Agency (PNA) release country's latest updates about the South China Sea disputes - "China does not recognize Hague’s arbitration court jurisdiction in South China Sea". China has still refusing to take part on territorial disputes in the South China Sea (SCS) hearings in the The Hague-based Permanent Court of Arbitration initiated by the Philippines. It is because according to Vice Minister of Foreign Affairs Liu Zhenmin, China does not recognize the court’s jurisdiction and will not participate in the hearings. According to the Yahoo news, the Hague-based tribunal rejected Beijing's claim that the disputes were about its territorial sovereignty and said additional hearings would be held to decide the merits of the Philippines' arguments. Secretary Albert del Rosario of Philippine Foreign Affair after U.N. court to hear Philippine case against China over S. China Sea said "will contribute to the peaceful and long-term resolution of overlapping maritime jurisdictions in the South China Sea", Philippine News Agency quoted. Foreign Minister Fumio Kishida said Japan will "keep a close eye" on the arbitration court's moves as respecting freedom of navigation and rule of law at sea are of "great interest to the international community. ", Philippine News Agency quoted. The Philippines unilaterally filed claims on the territorial dispute with China to the court in January 2013. 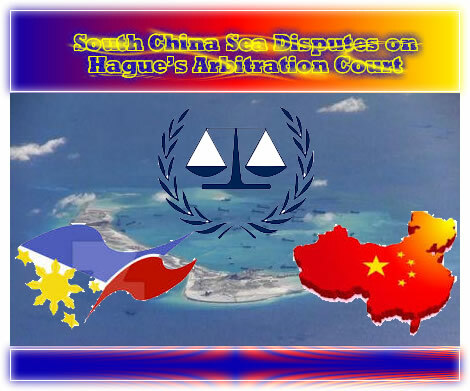 And after 2 years, October 29, 2015 Permanent Court of Arbitration in the Hague decided to expand its jurisdiction to the South China Sea to consider the case of a territorial dispute between the Philippines and China. It is after a U.S. Navy destroyer sailed within what China claims as its territorial waters there earlier this week. International Tribunal trounces China’s arguments in sea feud and why it matters for PHL. Philippine News Agency (PNA) Featured News. The Netherlands court can not rule on the ownership of the contested features. Its mandate is limited to the interpretation or application of the 1982 United Nations Convention on the Law of Sea on the 15 points that the Philippines raised against China, called “submissions” in arbitration parlance. Primary points raised by Philipines. 1982 convention which allows coastal states the right to manage, explore and exploit areas within its 200-nautical mile exclusive economic zone. China's alleged interfering with the Philippines' sovereign rights and freedoms, and construction and fishing activities that have damaged the environment. Tribunal rejected China’s argument that the tribunal do not have authority to rule on the case. Tribunal rejected the argument that the dispute is actually about the delimitation of a maritime boundary between them and therefore excluded from the Tribunal’s jurisdiction. The PH, 15 submissions reflect that the disputes between the two states concern the interpretation or application of the UN Convention. The court said the Philippines has met the Convention’s requirement that it has exhausted all options and avenues of negotiations with China before seeking compulsory arbitration. Beijing’s nine-dash line claim, a U-shaped encirclement found in Chinese maps, illustrates its ownership of almost the entire sea, including areas that fall within Manila’s territory would no longer be a basis to make this claim. It was established in the Netherlands in 1899. It encourage peaceful resolution of disputes between states, organisations and private parties. China and the Philippines are among its 117 member countries. October 29, 2015 - An arbitration court in the Netherlands ruled on Thursday that it has jurisdiction to hear some territorial claims the Philippines has filed against China over disputed areas in the South China Sea. The legal process involved two parts: jurisdiction and admissibility of the Philippine complaint and hearing on the merits of the case. The court is composed of judges from Ghana, France, Poland, the Netherlands and Germany. 3 Reasons the Philippines Will Suffer Because of Its South China Sea Case Against China. Above topic is a featured article from The Diplomat Site. Here are the short views of the 3 reasons. There is no guarantee that the Philippines is going to win the arbitration case. The arbitration case has seriously hurt China-Philippines bilateral relations in recent years. U.S. support might not be as strong as many in the Philippines seem to believe. Hydrocarbons - Oil was discovered in the region in 1968. It has a huge potential reserves. Commercial Fishing -The PRC (People's Republic of China) has predicted that the South China Sea holds combined fishing and oil and gas resources worth one trillion dollars. South China Sea accounted for 8% of the total world catch, a figure which rose to 35% in 2010. Commercial Shipment - said to be one of the busiest shipping lanes in the world.